ADL Skip Hire are your local Skip Hire and waste management specialists. We have a range of Skips and Containers suitable for domestic waste clearance and trade waste removal. ADL Skip Hire have been in construction and waste management for over 20 years. Based in Hoddesdon, Hertfordshire, we serve to provide an exceptional and prompt skip hire services to the surrounding Herts, Essex and London, including: Bishop's Stortford, Broxbourne, Buntingford, Cheshunt, Enfield, Essenden, Hatfield, Harlow, Hertford, Hoddesdon, Nazeing, Potters Bar, Puckeridge, Sawbridgeworth, Stansted, Stevenage, Waltham Abbey, Ware and Welwyn Garden City. Household skips are available in a range of sizes, suitable for a host of different purposes. Whether you're working on a little home-improvement or having professional builders work on your home. Our extensive range of commercial skips are designed to cater to the specific tasks of your company, whether you are undertaking a construction project or working on a site that produces high volumes of refuse. A step-up from traditional skips, Roll On, Roll Off skips (or "RoRo" skips) are ideal for construction and industrial organisations who require the ability to dispose of a high volume of waste from construction to multi-storey clear-outs. Not sure which skip or container to hire? 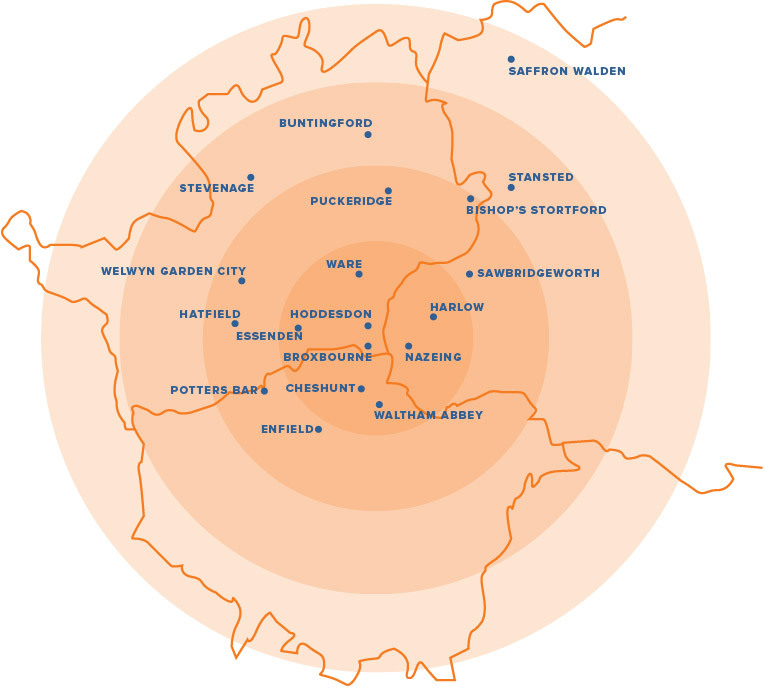 We have an approximate range of 20 miles from our based in Hoddesdon, Hertfordshire.